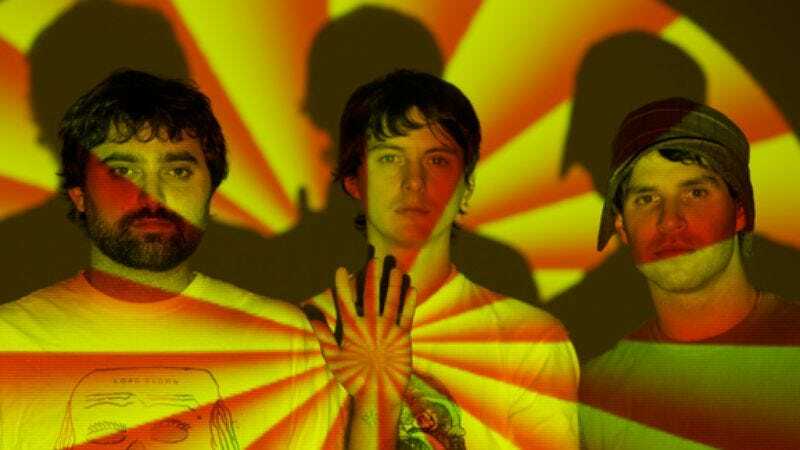 Animal Collective first emerged as a cult-like enterprise in downtown New York around the turn of 2000. The group consisted of David Portner (a.k.a. Avey Tare), Noah Lennox (a.k.a. Panda Bear), Brian Weitz (a.k.a. Geologist), and Josh Dibb (a.k.a. Deakin), grouped in different configurations over the years. They started out wearing animal masks and making mewling noises over what sounded like warped music for ancient rituals; while the same can be said for them now (minus the masks), they operate on a very changed scale. The gentle folk album Sung Tongs gained Animal Collective lots of attention in 2004, and its fan base has grown since then, through 2005’s Feels, 2007’s Strawberry Jam, and especially this year’s Merriweather Post Pavilion, a freewheeling carnival of an album given to everything from quasi-Caribbean rhythms to crypto-operatic vocals to dizzying post-psychedelic whirs. The band recently spoke with John Norris, who previously worked at MTV News and now has his own interview series on Noisevox, a new music video site. The interview is available in its entirety via streaming video on Noisevox.org. The A.V. Club: This record came out, it got a ton of attention, and then after a handful of shows, you guys were invisible in this country for a few months. Did you feel like that was the best way to approach it? To let things settle down a bit and then come back? David Portner: We like to space out our tours. For the most part, we only like to do maybe a month at a time. That’s the most we can go for. AVC: Just for your own sanity? DP: For our comfort, it’s always been harder to go longer than a month. And when we put out Strawberry Jam, we did our U.S. and European touring really close together, and it felt like a little too much. So I think this time, we just planned to space it out a little bit more. And since our touring is usually a little bit stronger in the U.S.—our shows are always a little bit bigger—it just made the most sense to do most of the touring at the start in Europe. AVC: So it was just a byproduct that it allowed all of the chatter about the record—good and bad—to die down a bit? This almost feels like a re-launch. Brian Weitz: Maybe a little bit. I think after all of the craziness that happened in January, we just stopped looking at things anyway, because it got to be too much. And there was that weirdness around the release like someone impersonating me over e-mail and trying to leak the record, and a journalist gave out my phone number to some kids who started calling me on New Year’s Eve, so we just stopped looking at the talk, whether it’s good or bad. AVC: Even though it came out in the dead of winter, you’ve said this is a seasonal record, kind of meant to be heard in big, expansive, hopefully outdoor settings—and now, having held off on touring, you’re able to be here in the summer months. DP: January was probably the last month we wanted it to come out. We were a little bummed about that. But at the same time, we wanted it to come out as soon as possible. Once we make a record, we want it to get moving, and it’s out of our hands. But it would have been nice to put it out in the summer or spring. AVC: You have some outdoor shows on the schedule this summer—Prospect Park in Brooklyn, Stubbs in Austin—but is there no chance that these songs will ever be performed in the venue that gave the album its name? BW: I don’t know if we could fill that place. DP: We’ve talked to people about it, but it’s too early to say if it’s gonna happen. I think if we do it, we wanna put together like a larger-scale show with other bands we’re really psyched on, so it can feel like more of an event to us, too. Because I feel like by the point at which it could happen, we will have played these sets of songs so much that we’d want to make it special, rather than just another show. But of course it would be awesome just to play at Merriweather Post Pavilion. AVC: The reunited Phish is playing there this year, and of course it’s Woodstock’s 40th anniversary. It seems somehow appropriate that these songs will also be heard at Bonnaroo and Glastonbury, which are kind of the ultimate gatherings of the tribes on either side of the Atlantic. AVC: I’m actually surprised you haven’t played there yet. BW: We just don’t bend over backward to hit some of those landmark festivals, because we are so protective about our personal schedules. Noah has a kid, and I’ve got a relationship, and these guys are married, and we guard our personal time pretty intensely. So sometimes we get an offer for something like Bonnaroo or Glastonbury, but we’ve already decided that it’s in a period that we’re not doing anything except being home. We usually don’t go back on those decisions. AVC: Going back to the album release, I think anyone who followed music last fall knew how much anticipation there was about this record. Did the level of attention and acclaim surprise you? DP: It’s definitely surprising to us, especially acclaim-wise. Every time we make a record, it feels like something different to us. We’re always unsure how people are going to respond to it, both our really dedicated fans and just critics, so in that sense, it was surprising. But I think definitely the most shocking of all was kind of all the hype and the overexcitement, because it overflowed onto us, with people saying “Why did you do that? Why did you do those listening sessions, just to create hype?” or “Why did you do that leak on the record, just to create hype?” We just wanted people to hear the record. So that was a little much to handle. And it was good that it kinda died down after a while. Maybe that’s a little why we backed off, too. AVC: There’s been a steady increase in awareness and appreciation of this band with every release since Sung Tongs, at least. But this time, it was really exponential—way more of an increase in attention than with Strawberry Jam. Can you attribute that to anything? Noah Lennox: I think maybe that there’s really heavy rhythms on this record, and the singing is more prominent than it has been on the past couple. I feel like really mainstream pop music these days is focused on bass and heavy rhythms and stuff like that, so maybe this record fit into that mold a little more, and that’s why. I also feel like there’s not a lot of super-abrasive sounds on the record. Everything is sort of put in a place where it’s fairly easy to swallow. AVC: The harshest among your purists will ask whether that was a calculation on your part. Was it a deliberate decision to make it less abrasive or even accessible? Is that a dirty word to you? DP: Not a dirty word, but not one that we use very often. I think for us, it’s just a question of being in the mood. It felt like the right record at the time. The abrasive stuff is pretty pleasurable to us too sometimes, but we were feeling like doing something different. It certainly wasn’t calculated. AVC: “Summertime Clothes” is the new video; can you talk about that? DP: Our friend Danny Perez made it, who’s done one video before for us, “Who Could Win A Rabbit,” and who’s also someone we’re working on a long-term movie/visual project with, that we’ll hopefully finish up this year. And we just wanted to do something very visual. And Danny, sometimes we’ll give him an idea and he just takes it to another level. He’s kind of a genius at designing these crazy costumes for people, and he loves visual elements and eye candy, so there’s a lot of that in it. AVC: And there’s a dance troupe in it? DP: There’s two. One is the FLEX dancers from Brooklyn, kind of like a pop-and-lock style of dancing. BW: Main Event is like the specific dude. There’s like four or five guys. AVC: What about those costumes? Was that Danny’s design? DP: Yeah Danny did the costumes; I don’t think it came across so well on Letterman because of the timing, and it was really rushed. But he just designed the costumes so that they could move within them. And we didn’t really realize that they would improvise so well within them, but when you see what they were able to do in the video, it’s pretty crazy. AVC: “Bluish” seems like the most overtly romantic thing you’ve written. AVC: Have you done it live? AVC: is that the only song on the album you haven’t done live? DP: It would be hard to do that rhythmically. There’s a lot of rhythm and drum overdubs on that one that would be hard to do without a lot of backing tracks, which we try and stay away from as much as possible. NL: And the samples were pieced together in a strange way that I don’t think we could really do live. DP: It’s more like a jam, kind of like a mellow thing. We wanted to something more spacious. But it’s short. BW: And “What Would I Want Sky” is something that Dave wrote for Merriweather and sent Noah and I, but we didn’t have time to work on parts before we got to the studio, and then one day a week, the engineer would like to have a day off. But we would usually go into the studio anyway and work on the songs that we had never played live, and some that didn’t make it on the record. “What Would I Want Sky” is one we just never got to. We just didn’t have enough time, so we worked on it in Lisbon in January. We all went to Lisbon to hang out for a week, and that’s when we made a full-band version of that song. DP: Hopefully, we’re gonna do a kind of Brother Sport EP at the end of the year, with the extra tracks and maybe “What Would I Want Sky.” I think that would be sweet. AVC: And the big news this week was the Animal Crack Box set, which sold out of its 1,000 vinyl copies immediately. And that’s it, right? There’s not gonna be more? DP: Yeah we realize people get bummed on that kind of thing, but we never really intended it. It’s like this handmade thing. BW: That’s the aesthetic of the label Catsup Plate. Rob, who runs the label, came from this specific Northwest cassette culture where things were all handmade, and Dave and I in the ’90s got into some bands that are a part of that, so it’s like a bond we have with Rob, and it’s all about these very personal items from the artist and the label to the fans, and the people that buy that stuff. It’s like giving them a piece of art that you’ve touched by hand. And there’s only so many you can do. AVC: With this tour, you’re not doing so much road-testing of new stuff. DP: Yeah, because we’ve been working on the film thing with Danny, and all the stuff we’ve been writing and working on at home—it’s been really hard to think about writing stuff for a new record. We all really want to make sure that we’re going somewhere new before we start working on a new album’s worth of stuff. It’s something we’re talking about a lot, and I think we’ve decided that for the first time in a while, we all want to be in the same place, rather than Lisbon, New York, Washington. AVC: Noah, does that mean you’re the one who’ll have to come to New York? NL: Yeah, I think me and my family will come here for a little while. AVC: Is there another solo record in the works for you? NL: I’d like to do one. I started working on a bunch of songs, but I haven’t really found the space that’s really good to work in; I’m not sure when I would work it in. BW: I think the visual project with Danny will seem like a sharp left turn. It’s weird to think of it as a record, but it’s definitely the next project. AVC: Is that due this summer? BW: It’s hard to say. At this point, we’re funding it ourselves, and we’re booking the studio time just when we have the time and actual resources to work on it. We’re definitely in the studio phase of it, where it’s like mixing and syncing things up to visuals, so who knows. AVC: You’ve said that it may be the most experimental stuff you’ve done. BW: Maybe, sound-wise, but it’s more just the process. We really don’t know what we’re doing; we’ve never scored a film. And we’re doing all the sounds, the Foley. I didn’t even know what the word Foley meant before we started this project. We’re recreating all the sound design from scratch. We’ve just had to teach ourselves how to do it. AVC: The box set and Merriweather may have taken you as far as you want to go in that direction. As you were saying, in terms of lifestyles, you’re in different places now. There’s a feeling like a chapter-ending for you guys. Is that overstating what’s going on? NL: It’s not so much an ending to me as sort of a re-starting. It kind of feels like we have come full circle in a bunch of ways.